In the past few months, during my Spirit-imposed hiatus from blogging and Healing Ceremonies, I have had a really profound, "HELLOOOOOOOO!" from the Plant Spirits and Mother Earth. I have been slowly expanding my focus and concentration, and have started to be able to listen to the softer, more subtle voices of plants (as compared to all the animals in my head)! For this playful and distractable Coyote, it has taken a lot of work to be able to Listen and not second-guess what I think I am hearing. There are many numerous books on animal spirits (Animal Speak is a good one, and so is Bird Medicine, by a friend), but not very many on Plants. Or at least not very many in my library at home. Although I miss the back-and-forth discussion of shamanism classes, I am trying to increase my confidence, and communication, by writing down my UPG insights and comparing them with others via books, Skype, healing ceremonies, etc. later on. Many times, they overlap (upcoming entry on Oghams soon! ), which is always a delight and builds trusting relationships. Which brings me to Hawaiian Woodrose. Recently, I was introduced to this plant in a discussion of visionary plant spirits. I did a bit of research, and learned that it has been used in Latin American and India as a hallucinogenic, healing plant. And even though hallucinogenic plants have been used by shamans for many many years for healing, I do not have that type of training, and I have not established that type of relationship with this plant. So what to do? Hawaiian Woodrose has given me a gentle tap on the head to get to know Her, and yet I live in a country in which all hallucinogens are considered illegal drugs (even if they are not technically schedule I - V)... Aha! Time to get my hands into Mother Earth, and do some gardening! I soaked and planted some seeds (9 to be exact, cause I like the number), and seven sprouted and took root. In the past two months, She has grown many gorgeous heart-shaped leaves that are covered in soft, fine hairs. 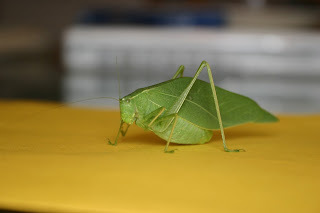 I've had to re-pot Her, as Her root system is immense, and have noted that small, light green Katydids rest on her leaves when I am sitting outside (what a great symbiotic relationship!). We have slowly started to get to know each other, and She has been a great healer for me so far! I enjoy Her compassionate energy, after a looooong day working at a psychiatric rehab., because She just sits with me and helps me to focus on myself, and my own compassionate nature after I feel drained and cranky and can't be around humans for a few hours. It's also been very easy to hear Her in my head, after I take a few deep breaths, and so I've not needed my rattle to help calm my Coyote-brain. I look forward to learning more from Her, and building our relationship of mutual healing through spiritual gardening! Have you ever started a relationship with a plant from seed? What did you learn? ooooooo--love the plant spirits. :-)) When i do energy work with someone i call in my sacred redwood grove, which is my sacred space. I can feel the energy of the ferns and giant redwoods, hear the birds and insects, feel the presence of the deep forest critters, smell the fragrance of the air. It is truly magickal. Wow, i am feeling it all around me even as i write about it, i'm getting trancy now. Fun! Lupa (www.therioshamanism.com) has been doing a great deal of work with plant and fungal spirits that you might find useful. I think she's in the process of writing a book about it, actually.